A bit of a different post today, I want to try and stem into the Parenting category a little more and will try and get at least one blog post up a week aimed all you other Mums and Dads out there. 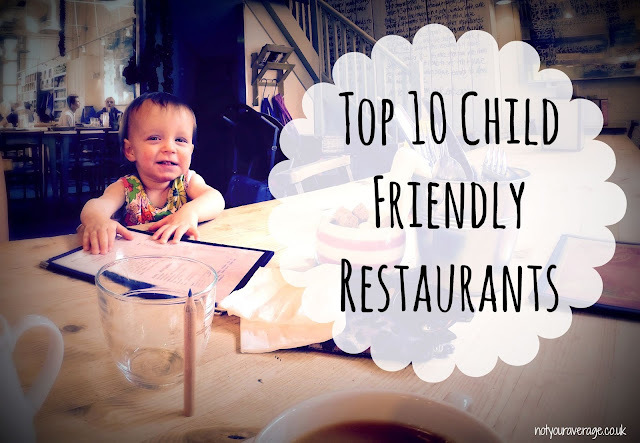 To start with, something a little simple but that isn’t controversial (although, I’m sure it could be depending on what sort of ‘judgey-parent-type’ you are), our top 10 Child Friendly restaurants/cafes to eat in. For the first year or so, we really struggled to take Millie out to restaurants with us as she would play up so much that it just turned into more of a chore than anything but now, we’ve started to eat at more places that we know cater for children and help them do things to keep their minds occupied. I do strongly believe that if most restaurants had an area where kids could wonder off to then it would make all of our lives easier, just somewhere thats cornered off with a TV screen in constantly streaming CBeebies or Disney Chanel and some crayons! Do you agree?! If you know of any other places that we can try, let me know! 1) Pizza Express - Most Pizza Express’ will have a little area on their bar where kids can make their own little dough shapes and if the chef has time/space in the oven, he will bake them too and bring them out with their food! 2) BHS Cafe - We’ve eaten at BHS a few times and our local one used to have a small fenced off area with a table, crayons and toys where your children could happily play whilst you finished your lunch/breakfast, fuss free! 3) Ikea - Only saying this because who out of us hasn’t eaten in the IKEA restaurant? There is a small play area for the kids to scurry off to once they’ve inhaled their Meatballs! And not to mention the £1.90 price tag for Meatballs and Chips! 4) Hungry Horse Pubs/Restaurants - Pubs/Restaurants with TV’s in the booths are just the future and they have a brilliant mix and match menu for little ones so they get to choose pretty much everything they eat. Enough said. 6) Frankie and Bennies - With activity packs, loud music and balloons galore, I rarely struggle to keep Millie entertained whenever we go to F&B’s! 7) Fayre and Square Pubs/Restaurants - Same as Hungry Horse, some of these places have TV’s in the booths, play areas outside and little games machines inside to keep them busy! 8) Wagamamas - A quick ‘in and out’ feel is key when you’ve got a toddler and when they offer mini versions of your dinner, it always helps to get them to eat their own food and not yours! 9) Nandos - Another lively atmosphere, colouring pencils and again, a fabulous children's menu meaning they’ll be eating similar things to what you are which stops chips going missing from your plate! 10) If you’re struggling still, let them choose where you eat and just hound them with ‘well it was your choice to come here!’ if they refuse to behave or eat their food! Going to try and get one out a week although sometimes it’s a struggle!! Nandos is really great. I always see little kids running around and nobody minds :) Lovely atmosphere!